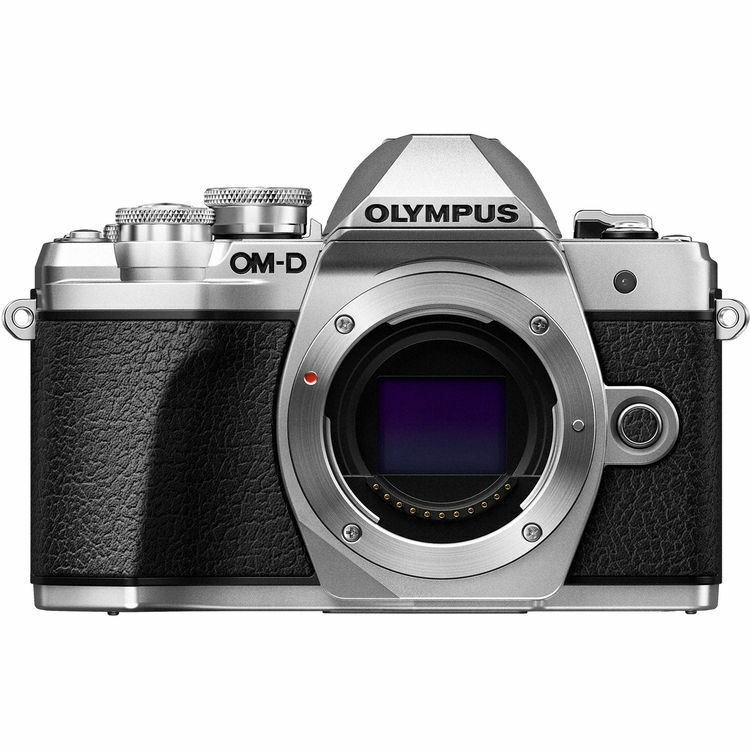 Compact and lightweight, the silver OM-D E-M10 Mark III from Olympus takes its place as an extremely capable entry-level option for shooters looking to pick up an SLR-styled mirrorless Micro Four Thirds camera. This iteration incorporates a 16.1MP Four Thirds Live MOS sensor and the Dual Quad-Core TruePic VIII Image Processor, enabling a variety of fast and powerful functions, including video recording at up to UHD 4K. The camera does retain its intuitive and rugged construction, benefitting from many physical controls as well as a 3.0" tilting touchscreen LCD and a 2.36m-dot electronic viewfinder with an improved 1.23x magnification. Additionally, various other functions have been implemented to make shooting more fun, such as 15 Art Filters and a Clips Video Mode that lets you quickly make videos in camera. The E-M10 Mark III features many capabilities to improve overall image quality. The most significant of these is the inclusion of a robust in-body 5-axis image stabilization system that can compensate for about 4 stops of shutter speed. Along with this, an upgraded 121-point contrast-detect AF system will help you lock on, track, and capture tack-sharp photos of your subjects. Speed has been given a boost as well with up to 8.6 fps continuous shooting and a sensitivity range of up to ISO 25600. 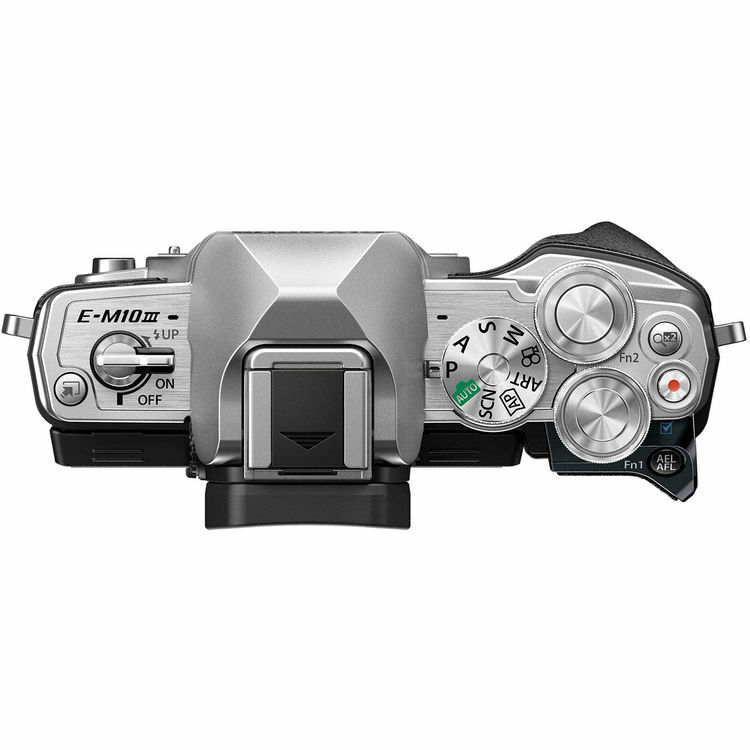 An electronic shutter function is present in the Mark III for even faster shutter speeds and silent shooting. Beyond all this, the camera of course features built-in Wi-Fi, this time with a QR Code function for even faster setup. 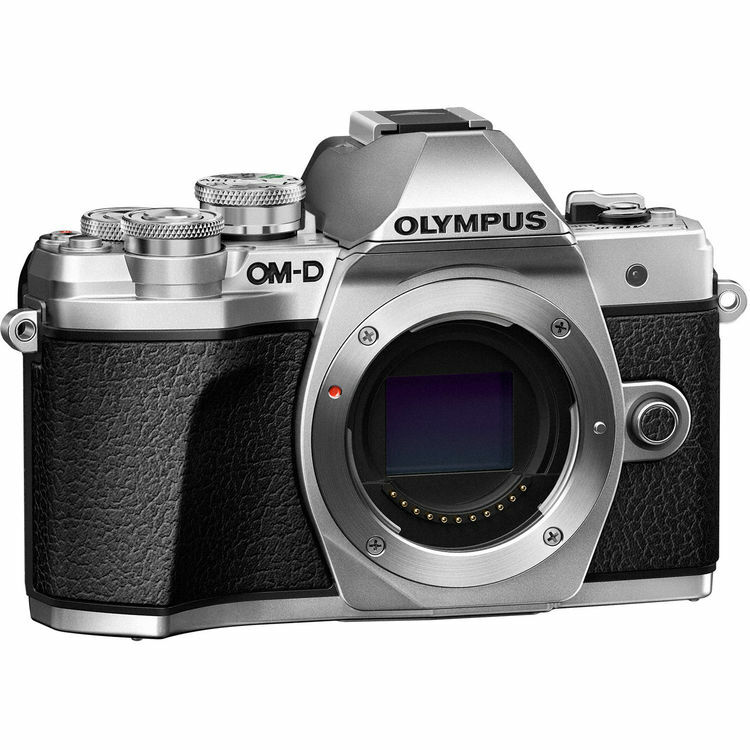 In order to create high-resolution imagery, the OM-D E-M10 Mark III is blessed with a Four Thirds 16.1MP Live MOS Sensor and the Dual Quad-Core TruePic VIII Image Processor, a combination designed to maximize speed and quality. It helps users create sharp photos and video in a wide range of situations using sensitivities ranging from ISO 200-25600, and which can be extended to ISO 100-25600. 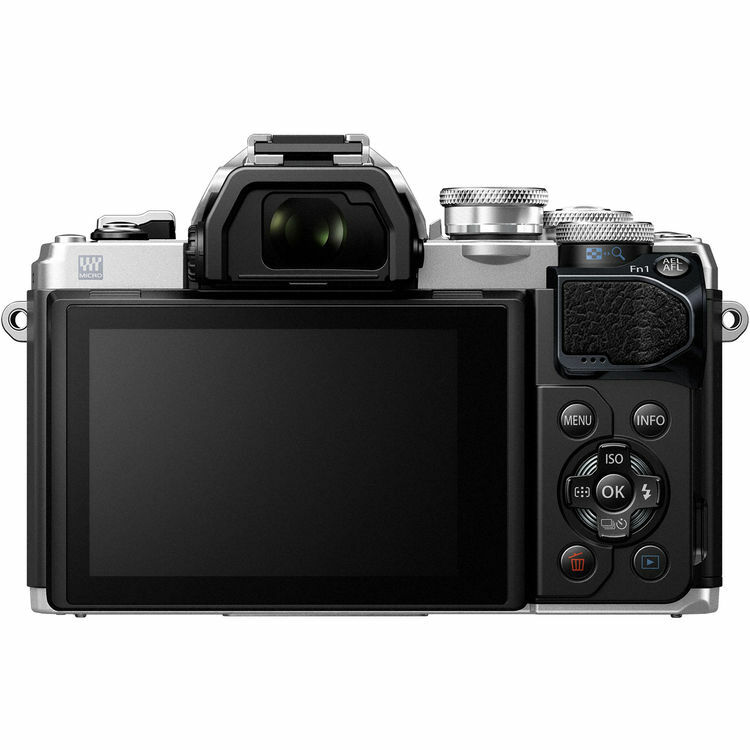 It also provides an electronic shutter function for faster shutter speeds and completely silent operation and can record uncompressed 12-bit raw image files. The added processing power of the TruePic VIII provides the E-M10 Mark III with greater video capabilities in addition to stills, this time permitting the creation of high-resolution UHD 4K video at up to 30p. Users can enjoy a high bit rate of 102 Mbps for crisp, detailed imagery and there are options for both NTSC and PAL frame rates. Full HD and HD recording features increased speed with options in Full HD for up to 60p and high-speed HD 720p at up to 120 fps. In addition to video recording, a Time-lapse Movie mode is also available for recording up to 4K UHD resolution with a 5 fps shooting rate to highlight subject changes or movement over a longer period of time. Full HD and HD time-lapse settings are available, too. Also, there is a Clips Video Mode present for in-camera video creation, including the ability to use audio transferred to your SD card. In-body, sensor-shift image stabilization helps to minimize the appearance of camera shake by up to 4 stops with any lens in use and compensates for camera movements that become especially noticeable when working with telephoto shots, macro imagery, and long exposures. Furthermore, this unique image stabilization system works across five axes to compensate for vertical angle rotation, horizontal angle rotation, horizontal shift, vertical shift, and rolling camera shake movement. This range of detected movements serves to benefit traditional still image shooting as well as movie recording and working with moving subjects more effectively. Additionally, image stabilization can also be used when framing shots, for more accurate compositions, by half-pressing the shutter button. Lock on and track subject matter quickly and effectively in order to guarantee tack-sharp imagery by using the E-M10 Mark III's upgraded 121-point contrast-detect high-speed imager AF system. Users can also access Touch AF functions via the rear LCD and will benefit from excellent tracking performance. Also, the E-M10 III can shoot at speeds of up to 8.5 fps with the ability to record burst of up to 22 raw frames or 36 JPEGs. A low-speed 4.8 fps setting is available with no limit to the buffer. Durable body features two dials, a directional pad, and shortcut button for fast, intuitive control. Built-in Wi-Fi is available for direct connection to a smart device and a QR code setting can be accessed for faster connection and setup. The 3.0" 1.04m-dot touchscreen LCD can tilt downward 45° and upward 85° for use at odd angles. 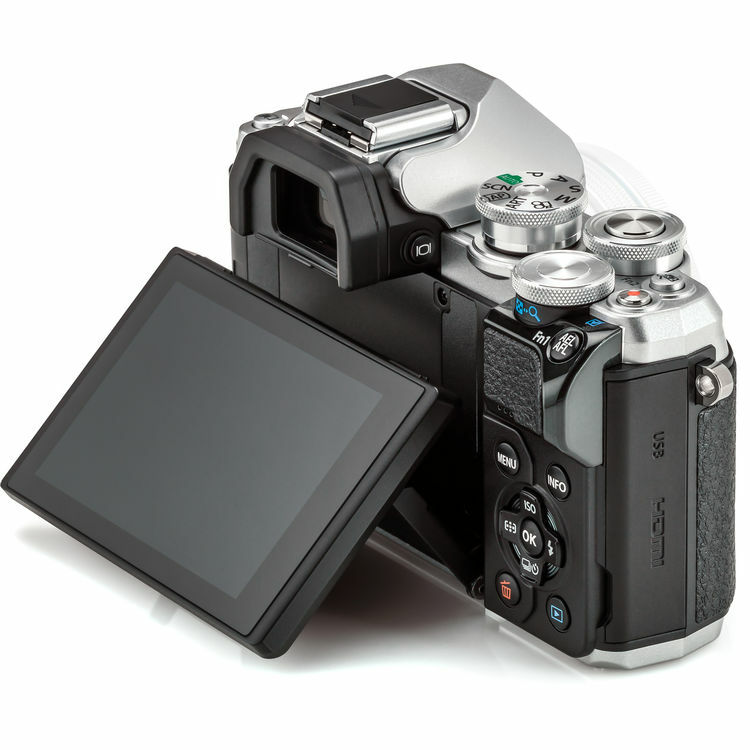 Touch control provides direct access to various functions: shutter release, AF area selection, AF area size adjustment, AF touch pad, frame forward/backward, magnified playback, Live Guide, Super Control Panel, Art Filter, Wi-Fi connection, video controls, video effects, video teleconverter, and timer. For eye-level viewing a 2.36m-dot EVF is available, which features an improved magnification of 1.23x for increased comfort during use. A mechanical shutter with a 1/4000 to 60 second range is present alongside a silent electronic shutter function with a 1/16000 to 30 second range. Built-in flash with guide number of 19' at ISO 100 for illuminating dark scenes. One SD card slot is available with support for UHS-II media. External flash units can be used via the hot shoe.